WILLEMSTAD - Curaçao Ports Authority (CPA) and union U.G.T.K. " CADMU " have finalized negotiations on a new collective labor agreement for the staff of CPA. 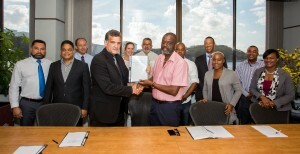 The signing of the new collective agreement took place last Friday, September 16th at the CPA head office. The signing ceremony was witnessed by the Minister of Economic Development ( MEO ) Mr Eugene P. Rhuggenaath , the members of the Supervisory Board of CPA Mr. S. P. ( Percy ) Pinedo and Mr. F. E. ( Jerry ) , Mr R. Manotas (CCO), Mr. A. Zwueste (COO) and representatives of the trade union U.G.T.K. " Cadmu " including the shop steward Mr. U.Delfina. CPA Director Mr Humberto de Castro , the president of U.G.T.K. " Cadmu " Mr. Wendell Muelen , Secretary Ms S. Clementina - Hay and treasurer Mrs. M. Bilderdijk signed the official documents.